A charming Grade II listed detached period cottage set back from the road and situated along a quiet lane in the heart of the village. 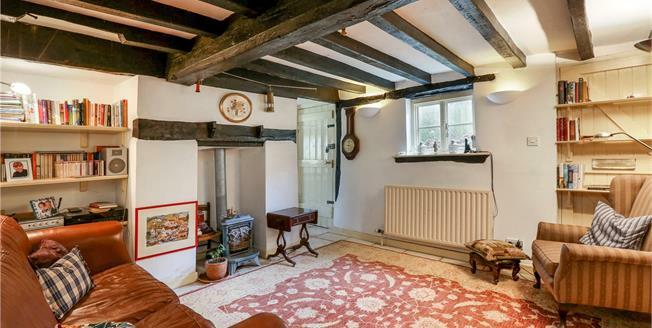 Many of the walls have exposed beams and there is an open fire in the sitting room and off street parking. As you enter the cottage on your right is a double aspect reception room, currently used as a dining room, and to your left is a second reception or family room with additional beams to the ceiling, a charming decorative wood stove and the original front door. From here to the right is the hall with a shower room, a door to the side, perfect for coming in with muddy boots or paws, and one of the two staircases to the first floor. Ahead of you is the double aspect kitchen and breakfast room, with the third reception room or sitting room off it, leading through the back of the house through French doors to the patio and garden. The sitting room boasts an open fire place and a spiral staircase that leads to the first floor. On the first floor off the main staircase from the hall are two of the double bedrooms. The front bedroom is double aspect, and the main bedroom has fitted wardrobes and leads to the ‘Jack and Jill’ family bathroom again, with a wall of fitted wardrobes. Off the second landing there are two further double bedrooms, access to the ‘Jack and Jill’ family bathroom and the spiral staircase down to the sitting room. The property is situated in the heart of the village which is just to the west of Didcot. Harwell is a thriving community with a strong Scouts, youth sports groups and other local clubs and activities for all ages. The village has a local Community Primary School, a pub (The Hart of Harwell), Bob’s family butchers and a local village store. Transport connections are excellent; Didcot Parkway railway station is approximately 2.6 miles away with trains to London Paddington (from 43 minutes), the A34 leads to the M4, M40 and the national motorway network and there is also a good bus service. More comprehensive day to day facilities including shops, supermarkets, banks and sports facilities can all be found in either nearby Didcot or Abingdon. Outside at the front is off street parking for at least two cars. A footpath leads past the flower beds around to the side and up to the rear garden which has a private gravelled patio area and raised garden that is predominantly laid to lawn with flower and shrub beds.